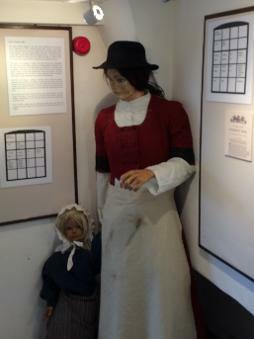 This is the most recent article in the series written by John Evans, one of our Committee members, devoted to the history of the town and of the building which today houses the Newtown Textile Museum. Robert Parry (Robyn Ddu Eryri), ‘An Address to Newtown Montgomeryshire’, 1833. The hyperbole of Parry’s Ode masked the reality of the conditions for workers in the flannel industry in the early nineteenth century. For centuries the industry had been scattered throughout the rural hinterland of Montgomeryshire, but at the end of the eighteenth century it had become centred in Newtown itself. The town became a magnet for those poor agricultural labouring families in search of better housing and higher wages. Nevertheless, working conditions remained grim for families like those who moved into our Commercial Street weaving shop. Mary Clayton 1841 - her story. My name is Mary Clayton. I was born Mary Humphreys, just across the river in Newtown, in 1797. I married Thomas when I was 23, just in time, as our eldest girl, Ann, was born a month later! You’ll meet Thomas when you go upstairs. He’s busy doing his shift on the loom. I’ll be taking over on a later shift. Thomas doesn’t like me working up there, he says us women and the children are driving down the wages. But what can I do? If I don’t work, some other woman will do it instead, and we need the money!! This, here, is our youngest, Amelia. She’s five. We’ve got six altogether. The other five are all working. Three are working upstairs on the looms and the other two are over in the fulling mill down by the river. It’s tough on the youngsters. In the busy time, they’re all working 12 hours a day, sometimes longer. They’re so tired, they hardly know what they’re doing. I don’t like them working down the mill, kids are always getting hurt there. Last week I heard that a 9 year old had her arm crushed in the hammers! And this is our house, number 2 Grapes Court. It could be worse I suppose, but it could be a lot better. It would be nice to have one of the houses on the front, and not have to have the smell of the privies in the yard outside in our nostrils all the time. And you need eyes in the back of your head with the kids. I’m scared one of the little ones will fall into the cess pool. But at least we’ve got a house to live in and work! Mind you, our pay doesn’t buy much, once you take out the rent. We’re always owing Mr Griffiths, the Master - so we’re forced to buy our food in his tommy shop across the road. All in all, life is tough, but we’re still some of the lucky ones. We’re all working. We have a roof over our heads and we’ve got some food in our bellies! Come to the Museum and find out more about Mary, Thomas, and the Factory owner. Mary's family tree is also available - thanks to one of our visitors. This was the first in a series of short articles written by John Evans, one of our Committee members, devoted to the history of the building which today houses the Newtown Textile Museum. These articles are intended only as a brief introduction to the history of the Museum, rather than a detailed historical account, but hopefully they will be of interest to all our readers . This was the second of John Evan's short articles devoted to the history of the building which today houses the Newtown Textile Museum. Another in the series of short articles by John Evans about the history of weavers in Newtown. 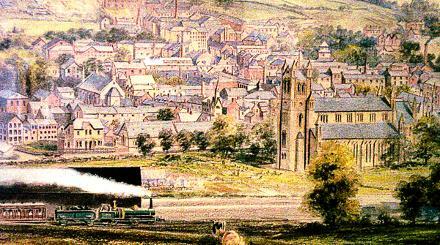 This delightful painting of Newtown in 1858 now hangs in the Textile Museum. It is a very popular exhibit, especially now that it has been rehung with better lighting.